If you have any punches at all in your stash, you will undoubtedly know that typically punches take up a lot of space, especially the more ergonomic ones (like the original thumb-press EK Success punches). I was intruigued when I came across the new slim line punches that EK Success debuted at the last Winter CHA show. These punches have a longer reach, snap shut for stackable storage and are labeled to easily find what you need. I decided to try out three different punches to see how they worked out - after hours of pouring over the sheves at local Michaels and AC Moore with coupon in hand, I decided on the following edger punches: the ZigZag stitch, the Postage Stamp and the Lines and Dots. I found the punches very easy to use. There's a button on the back that locks the punch flat for storage. When you want to use the punch you simply slide the button over, insert your paper and punch. I liked the fact that the punching handle was large enough to either squeeze with your whole hand when you are holding or pressing down with your whole hand (or both hands) if you are using it on a table. I didn't have any issues punching through cardstock or patterned paper. I did try punching through the packaging that the punch came in with no success. It's really only meant for paper. Despite my rough-handling I didn't encounter any problems with the punches and they appear pretty solidly contructed. Punches are a hot item right now and I gave quite a bit of thought to the punches I chose. I can definitely see that some punches would be more useful than others - I've already used my ZigZag punch quite a bit! I didn't purchase any of the Medium punches because I thought the punched images were smaller than I would use. The price of the punches is right in line with other comparable punches on the market. If you factor in the availability of coupons at the big box stores you can get these at a very reasonable price. - the designs, especially of the edger punches, are trendy and very usable. I have a few more on my "must get" list. - They punched well and I found most of the punches easy to line up -- the silver template on the base works perfectly. - The key feature, that they lock and stack is a huge bonus. Typically punches take up a lot of real estate, you could fit quite a few punches in the same space as one regular punch. - I didn't purchase any of the medium (non-edger) punches because I thought the images were too small. - Some of the punches are supposed to emboss also -- I didn't think the embossing part worked very well, at least for me. - I did find the line and dots punch a little bit difficult because the holes are so very small. 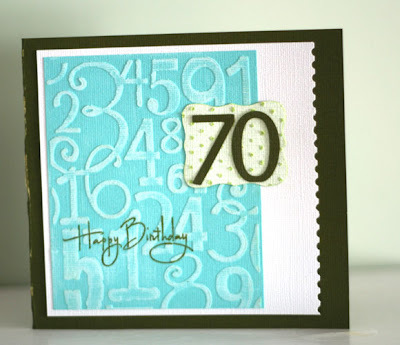 I used the the Postage Stamp punch on the white cardstock - worked beautifully with no problems. Supply List: Core'dinations cardstock, EK Success edger punch, Cuttlebug embossing folder, Slice machine, Wordsworth stamps. 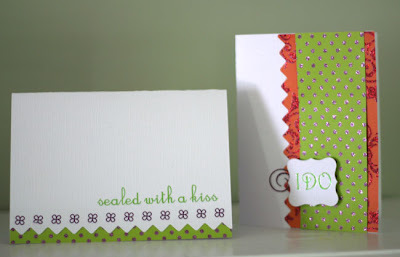 For this card I used the Lines and Dots punch. I had a little difficulty lining up the dots for a continuous punched line, this was due to the size of the hole -- they are really tiny. Supplies: Core'dinations cardstock, Piggy Tales patterned paper and rubons, Fancy Pants chipboard, EK Success punch. Supplies: Core'dinations cardstock, Piggy Tales patterned paper and rubons, EK Success punch. also available at local big box craft stores. What do you think? Have you tried these punches yet? How do you think they compare to the other punches on the market? Is the space saving feature important to you? I have the postal stamp one. I liked the way it stamped just fine. I love how small they end up being when closed. It really helps when travelign to crops for storage. That's the only one I have as I have a vast collection of Fiskars and MS punches and the designs seemed to be similar. I personally still prefer the Fiskars ones. Thanks for this review. I've been eying a couple of these and was really wondering how the embossed areas worked. I'll probably still buy at least 1 but I know not to be too disappointed if they don't emboss really well. I have a few of these and LOVE THEM. I can store three of these in the space it takes for my old border punches. I can't wait for them to come out with more designs. I'd also like to see my larger designs - the current ones are rather small, great for cards, but they can get lost on a large 12x12 layout. Ihave a few of the corder punches and have been really satisfied with them. I like the fact that they have some out that coordinate with different product lines. I have the one that looks like a tiny Threading Water, and I love it! It is so cute on cards. It also punches through paper so cleanly and easily. I'm definately buying more! I have the binding edge punch, which I love! I think its just the cutest thing and has so many uses. I like to make what looks like little journaling tags that got ripped from a book. The zigzag stitch looks like another I would definitely purchase and use! I have the scallop punch with the holes and the 1 inch circle and I love them. They are so easy to punch with that it surprised me the first time I used them. Can't wait to get some more. Thanks for the review. It helped alot since I haven't purchased any of these yet. But I now know I have to have the zig zag one. I just bought the binding edge punch this weekend and tried it a few times. I really like it and found it very easy to use. Better than some other punches I have. About a month ago, I bought a Martha Stewart punch that was supposed to cut and emboss, and I didn't care for it. The embossing part was OK, but the cut wasn't crisp. Took that one back! Great review...thanks! I have them and LOVE them! I did not "get" what the lines adn dots punch was for - now I get it. Thanks for showing the "punched" pieces. I have lots of punches but I had not seen these before - thanks for the heads up! I have quite an assortment of these new punches as well! I was a bit disappointed in the embossing feature, or lack of, as you mentioned. I also have found myself pinching the palm of my hand when squeezing them on cardstock which has resulted in a few blood blisters! Ouch!! But I still love these for their slim line and wonderful variety!! I would love to try these punches and love how they store. Might need to add a few of these to my collection. As mentioned already, the idea that they do not take up a lot of storage space is a huge plus in my book. Thanks for the review! I have two of them; the one that looks like spiral notebook paper edge and another that looks like a tiny version of the fiskars threading water. The mini-threading water one is very difficult to line up to continue the pattern. They punch very easily and are much easier to store or take with you to a crop.